Location: Creeslough, County Donegal, Northern Ireland. Notes: Doe Castle, or Caislean na dTuath, at Sheephaven Bay near Creeslough, County Donegal, was historically a stronghold of Clan Suibhne (Clan Sweeney), with architectural parallels to the Scottish tower house. Built in the 16th century, it is one of the better fortalices in the north-west of Ireland. It was here that Owen Roe O'Neill returned in 1642 to lead the Ulster Army of the Irish Confederate forces during the Wars of the Three Kingdoms. The castle changed hands repeatedly during the 17th Century struggle for control of Ireland between the English and the Irish. 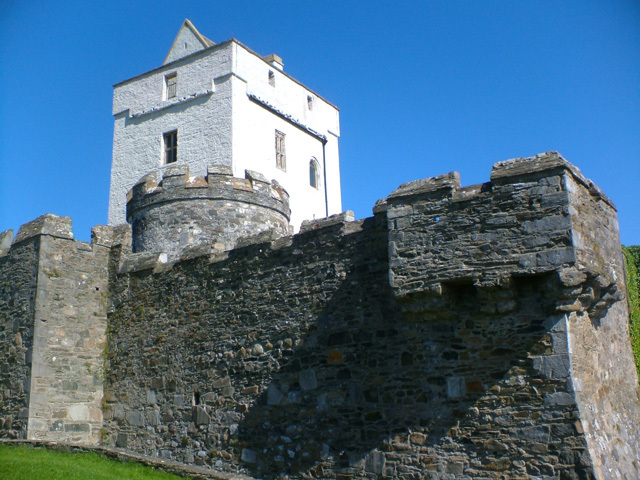 It is known that in 1650, Sir Charles Coote, the Governor of Londonderry, took possession of the castle. Eventually, the castle was bought by Sir George Vaughan Hart and inhabited by his family until 1843. The castle sits on a small peninsula, surrounded on three sides by water, with a moat cut into the rock of the landward side. The structure consists mainly of high outer walls around an interior bawn with a four-storey tower-house/keep. Irish singer Brian McFadden proposed to his (now ex-) wife, Kerry Katona, at the castle in 2001, being the spot where his grandfather also proposed to his grandmother.